This is a syndicated post from Twilio Developer Evangelist, Kevin Whinnery, originally published on the Google Cloud Platform Blog. Google App Engine enables developers to focus on their application’s logic by providing a scalable infrastructure and high-level APIs for persistence, file management, and other common web app needs. XMPP and Channels are among these APIs, making it ridiculously easy to write awesome real-time communications apps in the browser. Today, we’re going to break down an example application (view it live, source code) that integrates these two App Engine services (plus SMS messaging from Twilio) in a group chat application that connects users via SMS, XMPP, and browser-based chat clients. We won’t go through every line of code, but at a high level, this application is about receiving inbound messages and sending outbound messages. Let’s see how we do this via SMS, XMPP, and Channels. Sending SMS text messages with the Twilio API requires signing up for a Twilio account. Once you’ve signed up for an account, you can use your account SID and auth token to make authenticated requests against the Twilio REST API. You could just use App Engine’s built-in URL fetch service to interact with the Twilio API, but our official helper library for Java makes authenticating requests and serializing data much easier, providing a POJO interface to Twilio resources and functionality. We’ll be using the Twilio helper in this example. If you’re looking for App Engine specific reference examples, our friends at Google included this reference documentation in their doc site. In the actual servlet, we handle inbound SMS messages first by looking for a “STOP” command, which will indicate that this user no longer wants to receive text messages from the app. Then, we confirm that the user is subscribed (by looking for their telephone number). Finally, we send out a message using our MultichannelChatManager class. App Engine provides a simple API for sending and receiving XMPP chat messages. Our chat application can receive new messages over XMPP and send them back out to all subscribed clients, similar to how our app behaves for SMS. The Channel API allows server-side push to connected clients in an App Engine application. In our chat application, we will utilize this API to push new chat messages to browser-based clients. 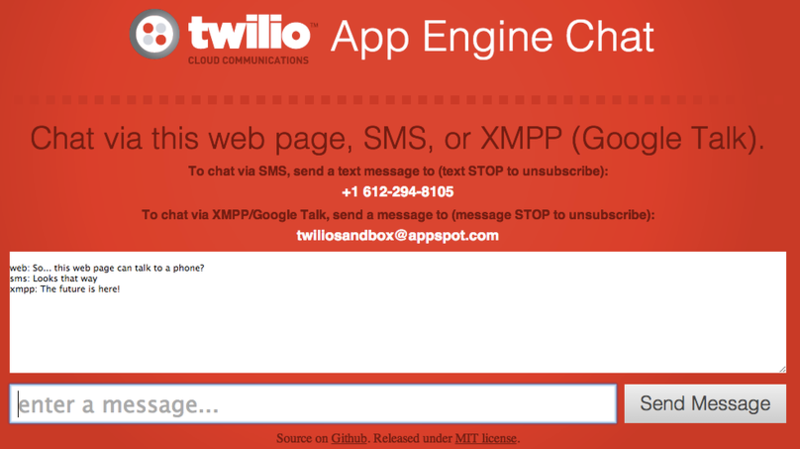 In this walkthrough, we explored three messaging APIs that work nicely on App Engine: Twilio SMS, XMPP, and Channels. Our example used Java, but all three APIs will work with Python and Go as well (Twilio has a helper library you might use for Python also). Using platforms like Twilio and App Engine, developers can create communications applications, which previously would have required expert knowledge and infrastructure to build, in a fraction of the time. I hope you’ll be able to use these APIs to engage with your users wherever they happen to be. Application source code is available on GitHub here.